Siberia debuts tonight on NBC at 10 p.m. Eastern. There’s a chance that Siberia will end up being a much better show than its first episode would suggest… or, if not better, exactly, then at least more enjoyably crazy and ridiculous. At its core, the show is the umpteenth Lost clone, throwing together a group of strangers in a remote wilderness, forcing them to live together while cut off completely from civilization, and then introducing an array of bizarre mysteries for them to solve. These days, such a familiar formula is unlikely to create great television, but it could easily be a goofily fun diversion, perfect for the summer doldrums. 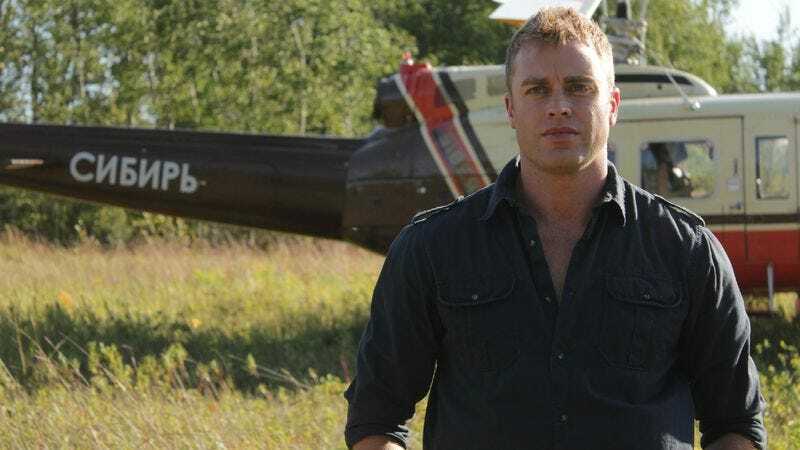 But there’s more to Siberia than that; its central gimmick is that this is all an extreme reality TV show, with the 16 contestants working together to survive in the Siberian wilderness and ultimately share a $500,000 prize. The show never betrays its reality trappings, and a new viewer could easily be forgiven for assuming this is all actually happening. By design, this illusion doesn’t last very long. Jonathon Buckley, the show’s blandly adventurous Australian host, kicks things off with an explanation of what Siberia is all about. This is meant to be less a game than it is a social experiment, as the contestants are expected to survive for months with no rules and no onsite help; emergency help is explicitly a helicopter’s ride away. Anyone tuning in unaware of the show’s central conceit would probably be a little suspicious at this point; this isn’t an unreasonable extrapolation of where the genre could be by, say, 2020, but it seems implausibly over-the-top today. Still, this first episode is only vaguely interested in satirizing the genre; the show leaves space in its format for such commentary down the line, but this first episode is a largely straight reenactment of any half-decent reality competition show with a few preposterous twists thrown in along the way. Those twists are the entire point of the show, and they are what could make later episodes compelling. But the show apparently believes it’s necessary to establish a baseline of normalcy before the craziness can begin, which means the vast majority of this episode plays like a standard reality TV episode. After Buckley explains the setup, the contestants race two miles to the cabins where they will live for the next few months. This stretch of the episode is virtually indistinguishable from the genuine article. The contestants explain in excruciating detail what they are doing moments after the audience saw them do it, and they occasionally add some vapid commentary about how they plan to approach the competition. Sadly, nobody actually says the ultimate reality cliché, the immortal “I’m not here to make friends,” but multiple characters convey the basic sentiment. The banal storytelling, the overcooked and petty conflicts, and the blatant attempt to hide big twists until the show returns from the commercial break—these are all elements that can be annoying on actual reality shows, but they are painfully tedious when the audience knows none of this is even pretending to be real. Siberia’s entire first episode is a bait and switch, but the show never offers a compelling reason as to why it needs to devote nearly an hour to the bait. At this point, even viewers who aren’t fans of reality TV are likely familiar with its conventions, and the show could have just as easily presented a shorthand version of all the “normal” scenes before getting to the more intriguing elements. That’s why it’s difficult to judge Siberia’s potential beyond this first episode; a closing credits promo suggests the rest of the season will be far more concerned with exploring the mythology elements, which potentially include the mysterious disappearance of the cabins’ original occupants a century prior, some sort of wild beast, and maybe even the Tunguska event. The promo also suggests the show will play around with an obvious question that’s only obliquely raised right at the end of the first episode—namely, whether some or all of these impossible, deadly events are the creation of the show’s sadistic producers. Again, none of this is likely to make for revelatory character drama, but there’s more than enough material here to power a goofily entertaining summer series. The larger ongoing concern is the frequently sloppy writing. In the opening segment, the host proudly announces there are “No rules, no voting, and no games” on this show, implying that these facts are what maintain Siberia’s bona fides as a social experiment and set it apart from lesser reality shows. But he then promptly reveal the contestants’ first task, in which they all have to reach the cabins located two miles due east; crucially, the last two to reach the site will be sent home immediately. That proviso sure seems like a rule, and the entire race aspect seems like it qualifies as a game by most sane definitions. This is a relatively minor contradiction, perhaps, but it suggests the show isn’t always certain of its own premise, which could become more problematic as it tries to juggle more complex elements down the road. Along the same lines, it’s hardly a surprise that most of the characters are underwritten and fall into a few straightforward reality TV archetypes. What’s more worrisome is that the characters can apparently abandon their one identifiable personality trait without warning. Most notably, Johnny—described as a bull rider from Jedburg, South Carolina—at first declares himself to be completely self-sufficient and rejects the group…until he randomly decides he actually would like to be part of the group and sits down by the campfire with everyone else. Now, there’s nothing necessarily wrong with such a change of heart, and it would probably kill the show in the long run to make one of its stronger personalities so completely standoffish. But Siberia wastes a potentially more meaningful future character moment in which Johnny recognizes that the insane circumstances require teamwork to survive. That moment could still happen, as Johnny could go right back to being an aloof jerk in the next episode, but any such character arc has already been badly undermined for no particular reason beyond the fact that the show needs something to pad out a couple extra minutes in this episode, and Johnny playing nice fits the bill as well as anything else. The nature of Siberia’s dizzily high-concept premise means that this first episode was always likely to be flawed. There are too many complicated elements to introduce, briefly explore, and then replace with even more complicated elements for this to be a really effective hour of television, even under the best of circumstances. If this episode had actually managed to be even halfway good, then Siberia might have had the makings of the next great summer series. As it is, this première is something of a necessary evil, a plot-required prerequisite before the real fun can begin. The final ten minutes do seem to offer hints of the more compelling territory this show hopes to explore. The unanswered question, as is so often the case with latter-day Lost clones, is whether the show will recognize which of its myriad elements is actually worth exploring. A certain amount of tedium is acceptable just this once in service of the show’s larger goal, but this is the only occasion in which that excuse works. The show tries to slip some mythology elements into its reality TV confessionals; notably, one character pointedly mentions he recognizes one of the other contestants, but he can’t figure out from where. This is rather painfully out-of-place among the standard competitive platitudes and banal descriptions of things we’ve just watched happen. There’s also one character who is clearly hiding something and never speaks directly to the camera (or, indeed, at all). Credit where it’s due: The show actually does a pretty decent job making all 16 characters memorable, or at least distinguishable. It helps that the show went with an international cast, as the primarily American cast also features contestants from Colombia, Britain, Australia, Montenegro, Taiwan, Iceland, Canada, and Israel. Even if individual characters aren’t especially compelling, you just have to remember who speaks with what accent. Silly as that might sound, this is the sort of storytelling shorthand the show could stand to feature more often.